We are a family run business that has been trading on the internet since 1996. We started off in a back bedroom and now operate from a huge warehouse based in Portishead, Bristol. The company's success is founded on the extensive and varied experiences of our staff and on our ability to take on board and react quickly to feedback from our customers. Over the past few years our name has become synonymous with quality kitchenware, a name we believe we have earned from the standards we set when selecting our suppliers and from the customer service we provide. The Company has an over-riding commitment to supplying quality kitchenware whether it comes from such household branded names like Mason Cash, Le Creuset, T & G Woodware, Bodum, Joseph Joseph, Susie Watson, and Apilco or from our own range which has been specifically selected by our buyers to offer you great quality at great prices. Each supplier has earned respect for quality, reliability and value for money. This in turn allows us to provide you with quality long lasting kitchenware which you will enjoy using. We will never part with any information about our customers, we do not sell our customer list. If you work for a newspaper or magazine however and you wish to obtain details of our product please click here for our contact details. If you wish to discuss advertising on our site please e-mail info@thebigkitchen.co.uk, who will be able to help you. Too busy to shop or unable to go shopping when you would like? We are a company dedicated to bringing our customers, all around the world, access to quality kitchenware. We want to have interaction with you our customer and welcome any comments you may have to make about our company and what's more we will react to them. Our aim is to ensure that our customers are able to select from as wide a choice as possible of quality products available from our numerous suppliers. 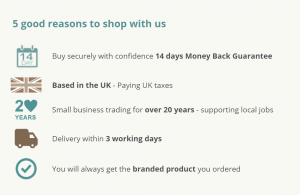 We aim to reduce the time you might normally spend searching your local shops for the exact product you want by bringing the shop to your home! We continually introduce new products giving you the best choice possible. We also have a popular discount hour once a day - where every item on the site is reduced by a fixed percentage for an hour only. If you are lucky enough to be shopping on the site when the discount hour starts, buy or you will miss the opportunity to take advantage of it again that day. We also send out a weekly news sheet to our loyal valued customers letting them know whats hot in the kitchen and offering something special - whether its a free gift, free postage or a discount that lasts all day. The latest idea we have introduced is our **star buy** option - spend over £30 with us and when you go to your order form you will automatically be given the option to buy one of our more popular items for your kitchen or tabletop at a very very special price. We change the item on offer weekly. So - Bookmark us, tell your friends, join our mailing list, send us your favourite recipe - we can only be as good as you, our customers, make us.